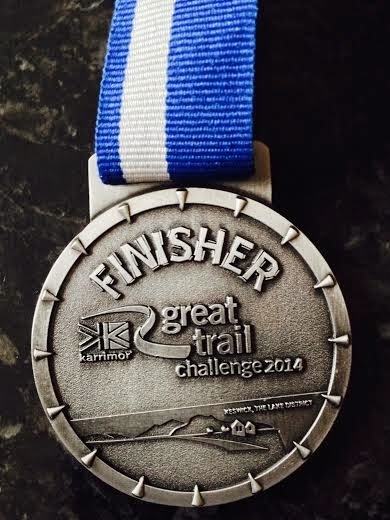 On Sunday 1st June 2014 I took part in my first ever trail run at Keswick in the Lake District. 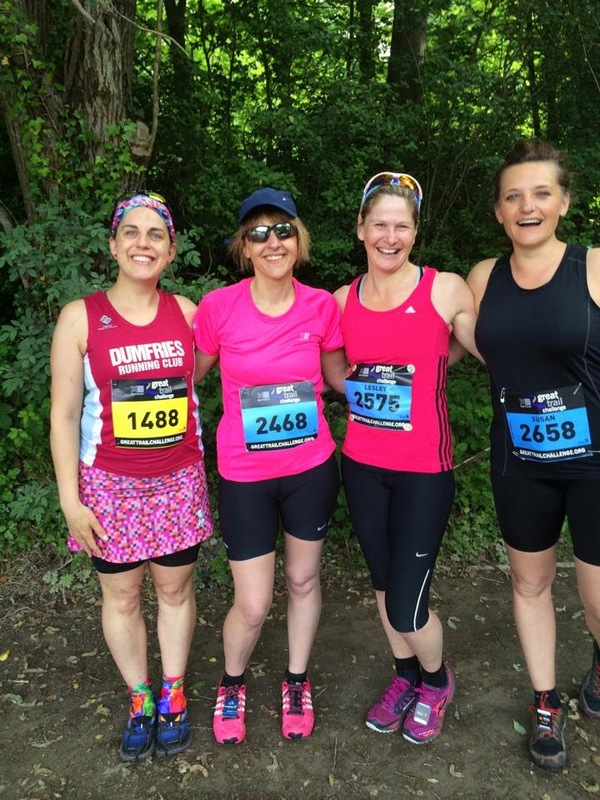 As we were travelling to the event in a girlie group I decided it was easier to go and stay at a friends house who lived near the race venue on Saturday evening so I didn't have such an early start in the morning. It was a beautiful evening and still fairly warm so once I arrived at my friends house it wasn't long before a bottle of cider was thrust in my hand and we sat out in the garden! This was my first trail run and here I was drinking cider the night before ... probably not the best preparation but hey I didn't have any expectations of a finish time! My main aim was actually finishing in one piece without tripping and injuring myself! Thankfully we managed to limit ourselves to just 2 bottles of cider before heading to bed! When my alarm clock rudely woke me up at 7.30am the sun was shining though the curtains and it was another bright, hot and sunny day! More akin to sunbathing on the beach rather than running a race! The other 2 girlies who we were travelling with us (and running) arrived at 8am and we all enjoyed porridge and a coffee together (in the garden again!) before setting off to the race. 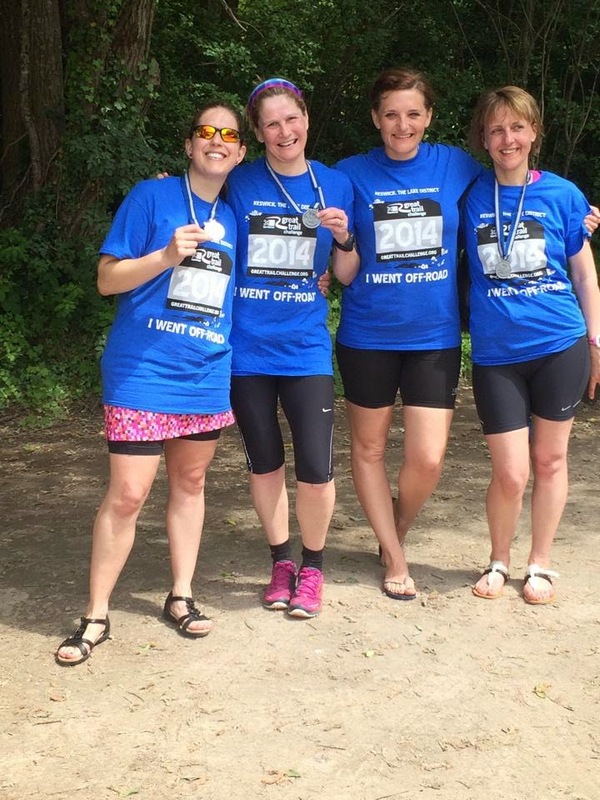 There were 3 of us running the 11K route and 1 who was actually the birthday girl was running the 22K route (what a way to celebrate!) which was actually made up of 2 laps of the 11K! The 22K race started an hour earlier than our race so we had to arrive at the race HQ early but at least this meant we had no problem getting parked in the car park at the near-by Leisure Centre! With having time to fill we got the opportunity to watch the junior championships start (and finish!) and we were amazed at how fast they got round and how easy they made it look! "we call this the Karrimor Challenge for a reason. 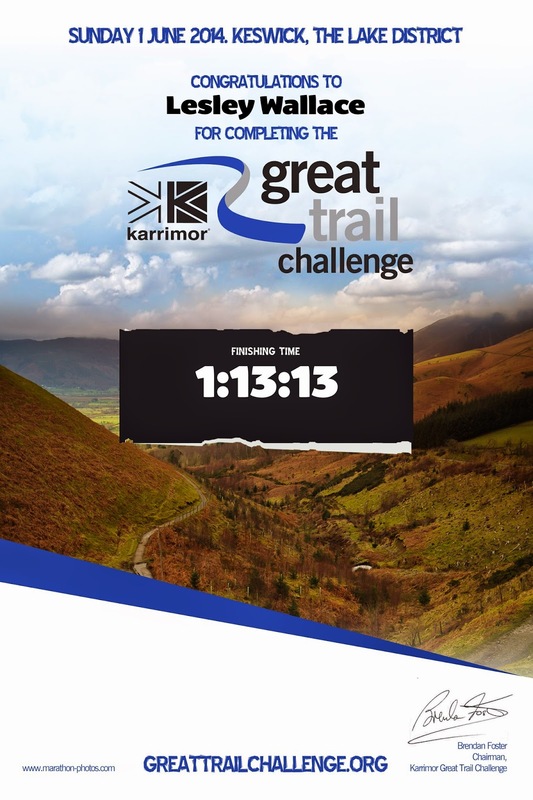 It's not called the Karrimor run because it's not just a run, the same way as the Great North Run is not called The Great North Challenge because it's not a challenge"
At this point if I could have escaped and fled I would! Perhaps it was a good job I was with friends who wouldn't let me back out! The 22K race started at 9:45am and runners had to be ready in their pens for 9:30am. We waved Jo off and wished her luck and watched and cheered as they did a lap of the field before they heading off out onto the course! After depositing our bags in the baggage area, and visiting the facilities we headed off to our starting pen ready for our 11K race to start! I waited nervously for the starting gun to go, wondering what I was doing here! The first wave set off and did a lap of the field and then in no time at all it was the second waves turn, which included ME! During the lap of the field it was very congested and difficult to keep a reasonable pace and at some points I felt like I was shuffling! However, once we exited out onto the old Keswick railway track the crowds dispersed and I could get into a better running rhythm. I was aware that there was some fairly steep hills coming up so tried to keep a steady pace on this flat part of the course (which was on fairly well made even tracks) as I wanted to save some energy for the climbs! 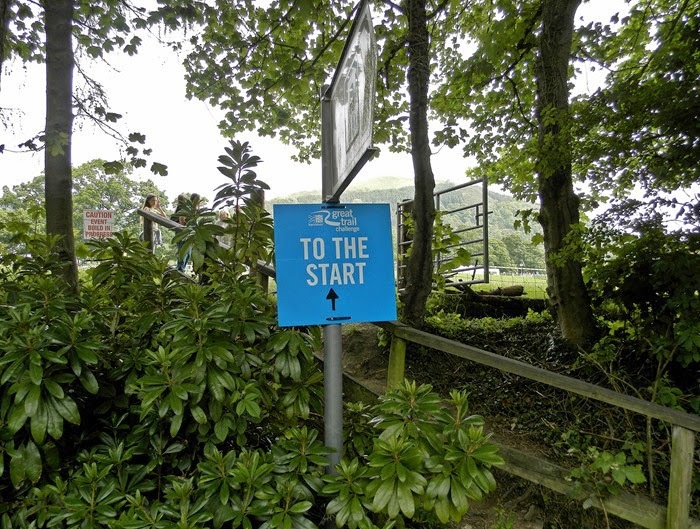 The course continued along the old Keswick Railway line, crossed the River Greta over the railway bridge at Brundholme before turning off towards Wescoe. The course then climbed the first major hill which was on tarmac roads and I managed to run albeit slowly up this. Thankfully we were greeted at the top with a much needed water station. After this there was a nice refreshing downhill section and we even had a decision to make at one point - to go over a bridge or through the stream! Despite it being a hot day I didn't fancy running in wet trainers so I was prepared to slow down and wait in the queue to cross over the bridge! Shortly after this was the brutal climb up and over the Northern shoulder of Latrigg Fell. There was a timing mat at the start and the finish of this climb and all runners got a time for this section with the fastest being crowned the King of the Mountain! The climb was hard, made even harder by the heat and I quickly realised that there was no way I was going to run all the way up it but the views were spectacular! It was pleasing to see that not many people managed to run all the way up and in actual fact I think I did it faster power walking then I would have if I had persevered with a slow shuffle run! Whilst power walking up this monster I said to a bloke "I'm pleased I'm only doing the 11K" to which he responded "I'm not and this is my second time up here!" WHOOPS! I think I may have passed out if I had had to go up there twice in a day! After this massive climb it was a time for the fantastic downhill section towards Keswick. I really enjoyed this and it was also timed in order to "defeat the Demon Descent" to see who the quickest descender was. Although I had felt like an OAP going up I felt like a big kid whilst coming down! I almost wanted to put my arms out and be an aeroplane! I'm sure I had a big smile plastered over my face the entire time! I had dreaded the downhill section but in actual fact loved it! Once down, there was one sneaky very steep climb which took me by surprise at around the 10K mark before returning to the event field towards the finish line. It was great to see the finish line and there was plenty of spectator support cheering us on down the home straight! 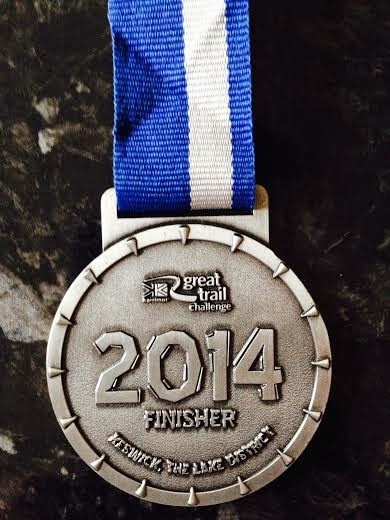 I think I would have cried if I had entered the 22k and had to do it all again! On crossing the finish line we were given a goody bag which contained a medal and a t-shirt as well as some sweets and energy bars etc. I was disappointed that the T Shirt was just a cotton one and not a proper technical running one! Not long after passing the finish line the others in my group finished too. Jo had managed to run the 22K and keep fairly consistent splits for both laps which is some achievement! I would have been upset if I had done the 22K as the medal, T Shirt and goody bag were all identical to the ones we got for going half the distance! I think the extra effort they put in should have been recognised in some way! After sunbathing on the grass for a short while we headed off to the pub and enjoyed a delicious afternoon tea made up of sandwiches and far too many cakes to eat! A great way to refuel after a race! You can view the hills on my Garmin here.